3 Characteristics of Your Baby's Skin Is Sensitive and Needs Special Care - Newborn skin is known to be soft and sensitive. But, there are some babies who are indeed born with sensitive skin types. Therefore, parents must be more observant in identifying the characteristics of sensitive baby skin so that you know better what to do to treat it. Basically, baby's skin is sensitive. Michael Freeman, a dermatologist from The Skin Center, explains in Essential Baby Australia that there are quite clear differences between baby's skin and adult skin. Because the baby's skin is still growing in its first year and is susceptible to infection. The outermost layer of the skin (epidermis) plays an important role as the body's foremost line of defense. The epidermis functions to protect the organs in the body from not being short of water while at the same time keeping the water from entering the body. In other words, the epidermis regulates the amount of water content that enters and exits. The epidermis also functions as a protective organ in the body from germs and viruses that cause disease. However, the epidermal layer of baby's skin is still very thin and basically, no natural moisturizer has been formed as in adult humans. This is what makes their skin prone to losing a lot of water compared to adults. There are several characteristics of sensitive baby skin that require extra care than usual. 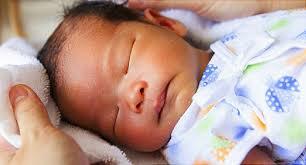 Sensitive skin is also generally more common in premature babies. Because their epidermis has not developed well enough like other babies. characteristics of sensitive baby skin that you need to pay attention. Red spots in infants are basically normal. The rash is due to the body's reaction to foreign substances from outside. However, if you are aware that more red spots appear, this could be a sign of an allergic reaction to the content of certain substances. Take it to the doctor to consult. Babies are prone to dry skin because the function of the epidermis is not fully developed. However, if your baby's skin looks often dull and very dry, you need to be extra tight in keeping your skin moist. Frequently apply a special moisturizer to baby's skin to prevent skin irritation, especially in the folds of the skin that often sweat. Consult your doctor if the moisturizer actually makes an allergic reaction to the baby's skin. The characteristics of sensitive baby skin can also be characterized by skin that is susceptible to various diseases, such as mildeczema, czema, prickly heat, ringworm (fungal skin infections), diaper rash , to impetigo (bacterial skin infection). These diseases will basically improve for some time along with the development of the baby's immune system. However, after a few days, if it doesn't improve, you need to consult a doctor. According to Freeman, there are some common mistakes parents make to their babies when they come to the hospital. One of them is over cleansing or excessive cleaning of the baby. Usually, parents use soap and shampoo that has hard ingredients when bathing, bathing the baby for too long, or even arranging too hot bath water. This is not good for baby's skin. Basically, there are many bacterial colonies that are located throughout the baby's body. These bacteria help influence the development of the defense system or the immune system in the baby's skin. As you know, the human body responds to foreign substances and enriches information to increase its defense. Excessive cleaning of baby's skin will make the whole bacteria die so that the immune system in the skin is not well developed. Temperatures that are too hot can also kill bacteria. This is what makes the baby's skin prone to various types of infections in the future.